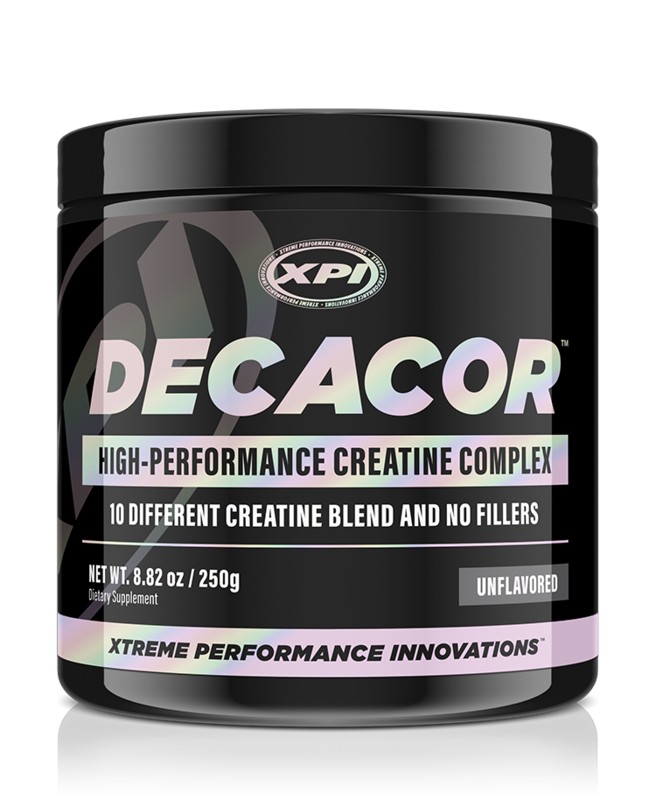 Decacor was developed specifically to meet the needs of the modern athlete. 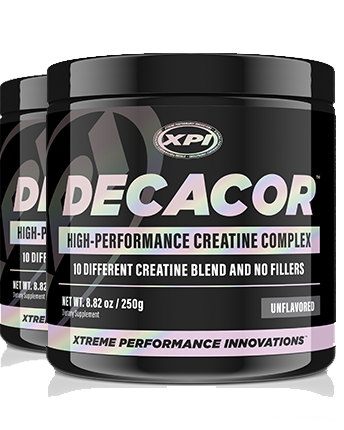 Complete with the most advanced technology engineered for rapid release and infused with 10 unique forms of creatine in every serving, Decacor is the most cutting-edge creatine product that XPI has to offer! Not only does the new formula contain more creatine per serving than the previous formula, but it will also increase your creatine intake 10 times more than the average creatine supplement. 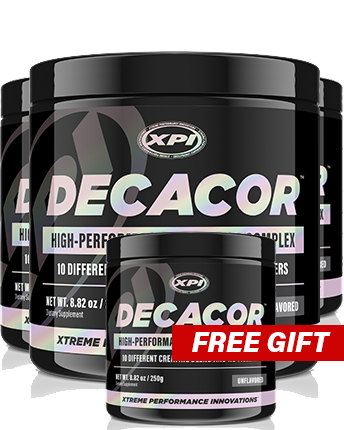 If you demand extreme results, Decacor is the best creatine supplement on the market today! Its one-of-a-kind formula is engineered to immediately deliver muscle and strength benefits! 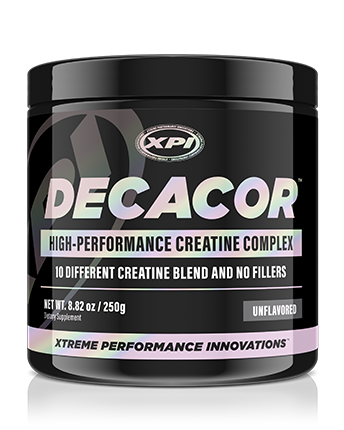 Unlike other creatine pills on the market, the new Decacore formula is fueled by the 10 most scientifically validated forms of creatine in existence. Creatine is supported by years of research and multiple published studies to rapidly build strength and size. In fact, in a study on 24 members of the Bulgarian National Weight Lifting Team randomly assigned to one of two groups, test subjects consuming creatine found in Decacor achieved significantly greater gains in weight and strength, beating the control group by 28.25% in just two months! 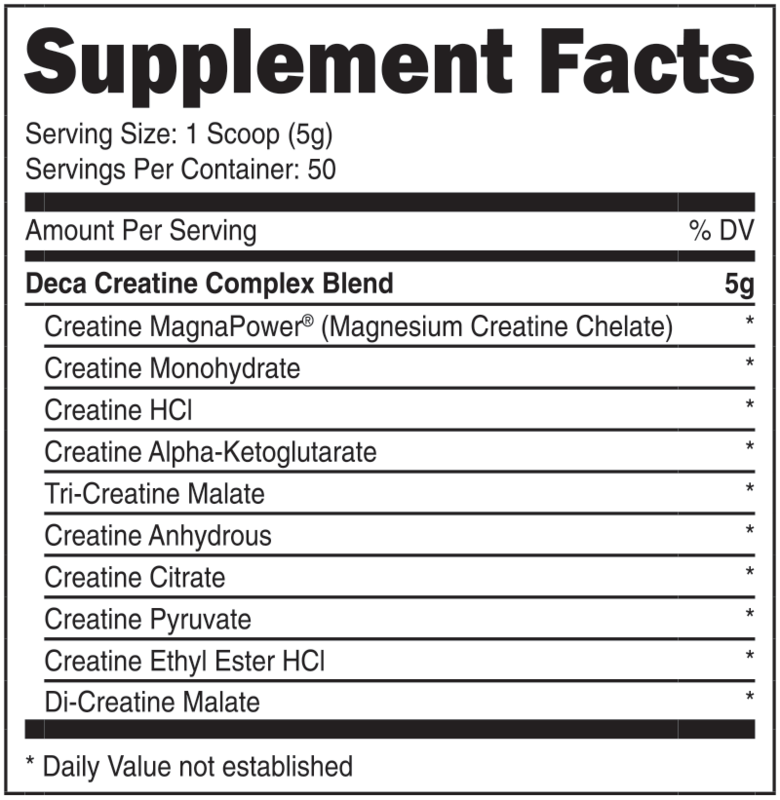 Creatine Monohydrate is the most popular and necessary item included in this list. 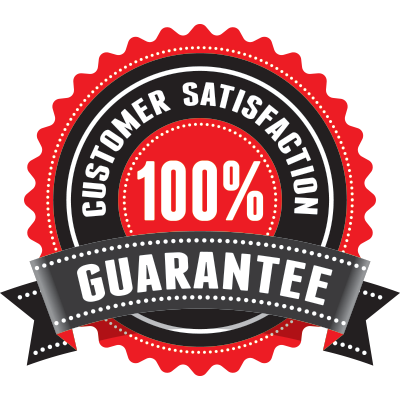 In 2017 scientists found that this specific creatine being added to a pre-workout would promise noticeably better results than if it were not included. This ingredient is a promise that you’re not buying a placebo. By attaching three monohydrate molecules to one malic acid molecules, making it water soluble, Tri-Creatine Malate has improved the method of injecting creatine into muscles directly giving your body more energy. No needles necessary. Creatine Ethyl Ester HCI is a creatine molecule with an Ester component, this gives it an edge as it can be absorbed through lipids. This prevents the ‘creatine bloat’ and the need to use twice as much protein to get amazing results. Creatine Citrate is the bonded molecules of creatine and citric acid. Citric acid is useful in this creatine compound because of the anaerobic energy it provides within muscle tissue. This creatine was created to work in two parts, one being easily soluble it makes it more readily available for the body’s use. And two by providing a clear ergogenic enhancements through improving aerobic metabolism even better than Citrate. Forming the Di-Creatine malate as a compound that has one creatine monohydrate molecule to one malic acid molecule was a stroke of genius. It allows the body to absorb twice as much protein and helps it produce cleaner energy faster. 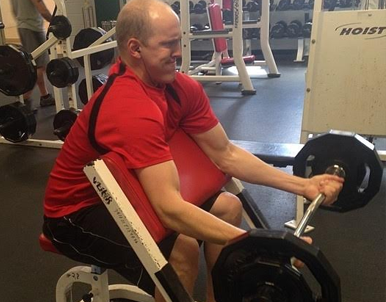 By removing the water molecule in Creatine scientists have created Creatine Anhydrous. A product that has a higher density of creatine than most other formulas, making it more potent than anything else on the market. This is one of the least known but most proven creatine types in the industry. It’s acidity makes it easier for your body to quickly break down, making it ideal for a preworkout supplement. Creatine Alpha-Ketoglutarate is one of the newest forms of creatine. 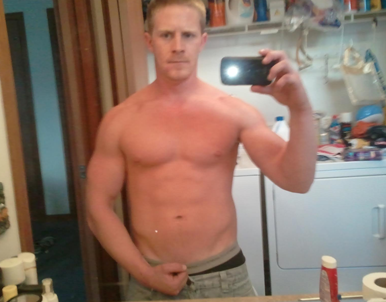 It’s creation was prompted by the desire to have the creatine applied directly to muscles, and because of it’s use of the Kreb’s cycle it has achieved that goal. 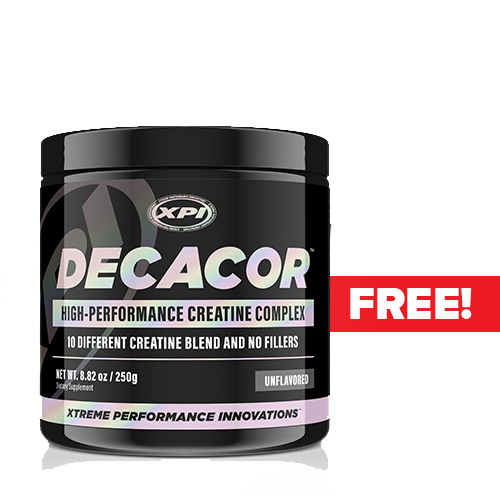 For a limited time, when you purchase a 3 bottles of Decacor, you’ll receive a FREE FULL SIZE DECACOR CREATINE. Decacor retails for $49.95. BUY DECACOR DIRECT & SAVE!